This snippet advertising a forthcoming Green Monday event demonstrates how M&S and Wal Mart both see being sustainable as a key part of a successful business strategy. 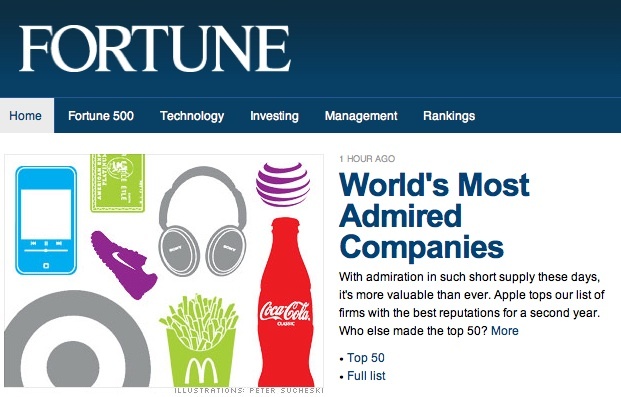 Fortune’s World’s Most Admired Companies survey comes out tomorrow if I have my information right. Not soon enough. After a year like we just had, it will be sobering to see how the world’s largest companies have fared. Several months ago I wrote that there would be a new world order in the reputation space and I think it has arrived. A number of the world’s golden children will lose their perch atop the golden pyramid of fame and fortune. I suspect too that overall ratings scores will be deflated year over year. It is hard to be overly enthusiastic about the showing we have seen this year, especially in the minds of C-level executives doing the ratings. I also look forward to seeing what they choose for the cover. For many many years, we had CEOs grace the cover of Most Admired because they were once popular and received the kudos for a job well done. No longer. The past several years had products as the feature on the cover. Last year we saw Steve Jobs, CEO of Apple, a CEO in a class of his own. Wonder what we will see this year? The good news is that this year’s reputation kings and queens might serve as ground zero for the next few years to come. My general sense is that we are starting over with a reordering of reputation royalty. 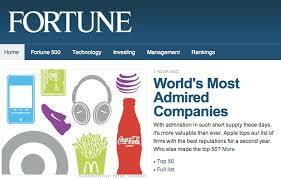 I look forward to seeing the changes among the most admired, my favorite yardstick of world business. Always something new to ponder. Thanks to Richard Edelman I’m flagging an upcoming book every PR should read: Capitalism 4.0 by The Times economics analyst Anatole Kaletsky. Here’s a preview. Kaletsky remarks that at Davos the world’s leaders were in denial. Instead of thinking about the future, it was easier to focus on the past, to quibble about regulations and argue about who was to blame. Kaletsky thinks governments everywhere will interefere more on economics and maybe less on welfare. I agree. There’s some big changes coming and it is time we discussed the choices we face. How will the West compete with China and India? Is Kaletsky right that the world has to choose either a Chinese or a Western model of capitalism? Will China remain overtly nationalistic and the West broadly globalising? How does AGW fit into this? How will the West define optimum state economic interference? Will the governing elite find economic policy hard to sell to voters? Will international competition lower the chances of bells-and-whistles CSR? “The new expectation of business is as a social actor, doing well while doing good. There is a continuum for business executives, from sole reliance on philanthropy to a more complex change of business process to incorporate sustainability into operations. My first observation is that CEOs were in denial when they belittled the importance of shareholder value and shareholders. My second is that change is about instability and that does not fit well with sustainability. My third is that the good that business does is business done well. The Edelman approach separates “doing good” from “doing well” as if there was something wrong or embarrassing or negative about the core function of business. The Chinese, on the other hand, have no such doubts about the virtue of business done well. But we are agreed that things are about to happen. We are agreed that there’s a great debate to be had. And once again, even when I disagree with him, I say hats off to Richard Edelman for raising our horizons and for being at the forefront of discussion. The debate has begun. Watch this space. BBC DG Mark Thompson is right to frame the question as “what is the BBC for” as opposed to (the defensive) “is the BBC too big”, but are his cuts the right answer to that question? The one that makes very little sense to me is cutting back on the BBC website. At a time when other media are expanding their digital channels, Murdoch and Brooks at NI are chewing over paid for access to digital content, and more of us are consuming news and entertainment online, this smacks of turning back the clock rather than reining in the spending. I love it when the Beeb discusses itself on air. Always a diplomatic affair with BBC inner politics simmering away below the surface. On Today this morning they trotted out a bunch of highfalutin’ commentators including cultural elitist Charles Moore (who refused to pay his licence fee until Jonathan Ross was sacked – a bit like Lord Ashcroft saying he will only register to pay tax if a Tory Government is elected. For the record, Ross’ Radio 2 show was one of the most entertaining shows ever, for an organisation whose stated role is to entertain as well as educate and inform, even if his pay was ridiculously high.) who droned on about dumbing down, Strictly and chasing ratings (what a dreadful thing for folk in the entertaining and informing business to do). A better move by Thompson would have been to share consumers’ credit crunch pain last year and go for a lower licence fee increase, rather than take the money, endure the media flack (Ross’ salary, taxi expenses etc) and then start cutting services that are bang on with a modern interpretation of its charter. Let’s face it, this is the usual defensive posture organisations like the BBC feel compelled to take in the face of the ritual Murdoch-driven, Tory attack on it. Yes the BBC should be well managed, prudent and popular, but it should also stand up for itself and have us as brand ambassadors. At the moment poor Thompson faces the worst of all worlds. Cutting services is not going to buy off the Murdoch-Cameron unholy alliance. Meantime badvocates are lining up rather than advocates. Meanwhile the other tax story rumbles on, while political anoraks like me try to work out what the negative fall out from the Lord Ashcroft story means for votes in the marginal seats that will decide the outcome of the forthcoming election and which Ashcroft is literally trying to buy for the Tories. The media are right to point out that the Tories are not the only party that take money from nom doms, an act of breathtaking hypocrisy for any political party seeking to run a democracy based on citizens who neither seek to or have the means to withhold tax from the wider national benefit. The difference here is Ashcroft is a senior official of the Conservative Party who is unashamedly funding a key seats operation to decide the election outcome with scalpel-like efficiency. I will pay my taxes – and a stack more from next month – under a forthcoming Tory government. Why should he have the right to decide he will only pay taxes if the party he supports is in Government? The Blair Government I enthusiastically supported in the past took money from people I really don’t like (though I assume Richard Desmond does pay his taxes) and one of the less appealing aspects of modern politics is the need to hold your nose occasionally around some of your rich friends. Obama showed there was another way. It may have incurred the wrath of the weather gods, but Accuweather is undaunted. The privately-owned meteorological service has encountered some stormy weather after deploying the term "snowicane" to describe last week's approaching east coast snow storm. Both The Weather Channel and the National Weather Service called out their biggest competitor under the umbrella theme of "it's not nice to hype mother nature." "Snowpocalypse to snowicane: Hype reigns in winter:"
"'It's almost inciting the public, inciting panic,' Evanego said of AccuWeather's terminology." 'It's not an apt analogy to compare this winter storm, which is really all about cold air and jet stream, with a hurricane, which is all about heat and ... things of tropical origin,' said Bruce Rose, vice president and principal scientist at The Weather Channel." May it rain cats and dogs on those other weather forecasters, the release begged. If the word "snowicane" brings more visitors to our website, then we'll continue to scare the bejesus out of our weather-worn fans. Warren Buffett said recently on CNBC that the rules of crisis management are get it right, get it fast, get it out, and get it over. For the first time ever, I’m going to push back on Mr. Buffett’s advice. The problem is that “get it right” often conflicts with “get it fast”. Three Mile Island got it fast and wrong; there had been a core meltdown and they said they’d be back online soon. The British police embarrassingly got it fast and wrong when they said emphatically they’d shot a terrorist at Stockwell tube; he turned out to be an innocent Brazilian on his way to work. They got it wrong again when Ian Tomlinson died at the G20 summit. The police said he never came into contact with them; this innocent bystander was shown later on video being hit by police. So the urge to “get it out” and “get it over” can make the crisis live on embarrassingly forever as a stain on the reputation, as it did in all these cases. “Get it right” should always be what matters most. So I’d add to Mr. Buffett’s advice that if getting it right means a crisis-hit body pauses for thought while the heat’s on, so be it. The media may be hacked off at first if the people at the centre of the storm beg for forbearance whilst they work out exactly what’s happened. But that phase will pass and then what’s remembered is that no-one got fobbed off with lies. What’s more, if a culture of quick response gets too rooted, organisations develop a line – a self-serving line – which can’t then be shifted in favour of the truth. Content summary: Summarizing the Euprera conference in Belgium; upcoming FIR Interview with Todd Maffin; announcing the FIR app for iPhone and Android; vote for FIR at Podcast Alley; Michael Netzley reports from Singapore on Millennials’ use of technology, and more; the Media Monitoring Minute with CustomScoop; why we don’t have any news items about the Chile earthquake; News That Fits: a future alongside Facebook for social networks in Europe, boomers take to social networks to protest and praise, avatars can make us better people says Stanford study, Pentagon relaxes social network access; listener comments discussion and FIR Friendfeed Room round-up; music from Parlotones; and more. For Immediate Release: The Hobson & Holtz Report, for March 1, 2010: A 64-minute podcast recorded live from Wokingham, Berkshire, England, and Concord, California, USA. Links for the blogs, individuals, companies and organizations we discussed or mentioned in the show are posted to the FIR Show Links pages at The New PR Wiki. You can contribute – see the show notes home page for info. © 2010 - visit the author for more great content, or connect with him on Twitter: @jangles. I’m more convinced than ever that social media is merely one in a series of ‘tools’ with which to engage in conversation. I say this at a time when advertising agencies, digital, shops and PR firms alike are battling for every available client dollar being allocated to social media. I say this at a time when PR agencies in particular are stressing out that their advertising and digital brethren will ‘own’ the big social media idea and, hence, the relationship. I say this at a time when two large clients of ours recently pulled us aside and said, ‘Hey, just a heads-up, but you no longer have to worry about only PR competitors calling up to get my business. Now, ad agencies and web designers are doing the same.’ That’ll do a number on one’s getting a good night’s sleep. It’s all merely subterfuge as far as I’m concerned. A consumer (regardless of whether he is a consumer or B-to-B purchaser) will make a buying decision based upon trust. The recent Edelman Trust Barometer says consumers surveyed now check five distinct sources (digital and traditional alike) before engaging with a brand. That sounds a tad excessive to me. Who has the time to check five distinct sources about anything nowadays? I sure don’t. I think our very own Sam Ford comes much closer to the reality of the situation when he says social media isn’t a silver bullet. It’s merely one part of a brand’s arsenal of communications weapons with which to build trust, become recommended and, eventually, stimulate purchase. I recently addressed two very different corporate groups on the subject of social media. The first was comprised of 25 ‘next generation’ fast trackers in the corporate communications departments of Fortune 500 companies. They stopped me in my tracks by saying social media wasn’t growing in importance as part of their overall marketing spend, nor was it being seen by the C-suite as a panacea. The second group was composed of human resource managers at very large professional services firms. They had the opposite point-of-view. They’d been told by their executives to figure out what was happening in social media and to ‘get something’ installed for employee communications ASAP. I told both groups they were missing the point. The Fortune 500 communications executives needed to be more vigilant about listening to what was being said about their brand in the online world and, if it made, sense, figure out ways to engage in the conversation. I told the human resource executives they needed to ask their employees how they wanted to be communicated with (i.e. Were they already burnt out from way too much social media discourse? Would they prefer face-to-face meetings, snail mail, podcasts or something else entirely?). The Edelman Trust Barometer provides valuable insight into the way consumers perceive brands. But, brand managers aren’t necessarily leveraging social media in the right ways. It’s not a one-size-fits-all approach. Nor is it about figuring out the five distinct sources of information a consumer will check before trusting a brand (just imagine the time and effort needed to track that information down!). It’s time we woke up and realized that, dare I suggest it, social media might not even appropriate in some situations! Trust is earned by a number of things: truth, honesty, transparency and, critically, listening. Ask your various stakeholders the questions a journalist is trained to answer before filing a story: Who? What? When? Where? Why? And How do they wish to be engaged? Maybe social media will be the answer. I’m betting it will be just one of many answers and, in some cases, rejected outright. I recently stumbled over a quote from David Axelrod, President Obama’s chief communications strategist. He said “We need to involve all the other members of the team.” He was referring to the uni-focus on Obama and the need to take some of the 24/7 news cycle spotlight off him by giving his team roles to play in the administration’s strategies. It was a smart statement because it applies to most CEOs as well. Reputation is often driven by the ability of the CEO to build a top bench strength. Not all but several of the top team in an organization need to play supporting roles and build the brand by what they do and say. The chief sustainability officer or chief financial officer, to name two, can add needed gravitas and thought leadership to a company. Demonstrating that there are successors and that leadership ability is a prime ingredient of a company’s strength helps build reputations. It was interesting to hear Axelrod mention this factor and he makes a good point. It cannot be Obama all the time. HubSpot released a new report that captures the state of the Twitterverse, opening a window that instantly transforms speculation into analysis and setting the stage for informed discourse and exploration. According to the report, Twitter’s user growth peaked at 13% in March 2009 falling to just 3.5% in October 2009. And while this is the most recent date for which HubSpot has access, it is revealing nonetheless. The steep decline, as I’ve said many times, has less to do with exposure and more to do with the initial Twitter experience for prospective users. Millions upon millions of new prospects are introduced to Twitter everyday by brands and media properties who place Twitter center stage in broadcast, print, and in person. Receive special discounts, promos, and coupons just by following us. Once they arrive at Twitter, there’s very little instruction or incentive to take the steps to not only create an account, but also adopt it as a form of daily or even weekly communication. Although user adoption is slowing, existing users appear more engaged. According to the report, the average user is following a greater number of people and earning a greater reach through an increased number of followers. Existing users are also posting more content. Once engaged in Twitter, the seduction of response, by a stranger or someone we know, combined with the allure of popularity is enticing and intoxicating. Many people fall victim to its addictive qualities as you are rewarded with feedback, connections, and presence through engagement. As such, Twitter is a rich network of opportunity to increase stature as measured through online social capital. Experienced users realize that the value of participatory media is powered by so much more than just simple tweets or conversations. Paying it forward, reciprocity, and recognition are the investments we make in earning attention and awareness for the value we bring to the table. When we realize that Twitter is far more than a tool to enliven self-actualization, “I Tweet therefore I am,” we uncork the essence of who we are today and who we wish to become tomorrow. As such, we embrace nuances of self-branding by presenting ourselves through bios, locations, and outbound profile links. Users are making the connection that they can define and shape the experience of those who clickthrough to their profile in order to better present the persona they wish rather than the personality left open to interpretation and perception. Social Media is making this world a much smaller place, linking us through the words we place into action and the topics, interests and passions we share. We’re forging highly focused and expansive networks that engender opportunities for collaboration, education, and entertainment and as a result, we’re finding comfort outside of our comfort zones. We are now citizens of international provinces where we establish the governance and culture and set the course for our new found freedom. Relationships are seemingly evolving into relations, where we invest in connections of those we know and also wish to know. However, while many users maintain following and follower networks numbering in the thousands, 82% of Twitter users maintain a network of less than 100 followers and 91% follow less than 100 people. The Twitterverse is a living and breathing ecosystem that moves and adapts to current events and the moments of opportunity when someone is prone to sharing, responding, or viewing the activity of their friends and contacts. Dan Zarrella and I previously discussed the art and science of retweets, and in this report, HubSpot examined user characteristics and patterns of use. What, when, and how we share, read, and bookmark tweets is governed by what I call the attention aperture. Our attention aperture opens and closes to match our daily regiment. We are only susceptible to learning at different times than we are to sharing. And through the analysis of the greater collective, we can observe patterns in this activity. HubSpot observed that Thursday and Friday are among the most active days on Twitter, with each accounting for 16% of total tweets. Furthermore, 10 – 11 p.m. is the busiest hour on Twitter, accounting for 4.8% of the tweets in an average day. HubSpot also documented the distribution of Tweets per day to get an idea of when people are updating their status, but also most likely, ready to be introduced to new, relevant content. In the report published in collaboration with Dan Zarrella, we observed that Monday and Friday were among the greatest opportunities for retweeting as those windows represented ideal time frames for when the attention aperture was wide open. According to the data, it appears that the growth of Twitter is indeed leveling. However, existing usage is only skyrocketing among the core group of users who didn’t necessarily need Twitter to tell them how to get value out of ongoing engagement. According to recent research conducted by Pingdom, Twitter is serving more than 40 million tweets per day. In reviewing the astronomical rise of Tweets published by existing users, we see that Twitter is now serving more than one billion tweets per month – crossing over for the first time in December 2009. From January 2009 to January 2010, the growth is practically blinding. Tweets, in just one year, ballooned 16x. In the last three months, Twitter experienced month-to-month growth close to 17%. Pingdom estimates that Twitter will process around 1.4 billion tweets as soon as February 2010. We can’t help but feel like we’re running on a perpetual treadmill of rapid evolution courtesy of the blurring pace at which the real-time is Web is accelerating. When reviewing the recent Pingdom data, the first thing that comes to mind is, that was then, this is now. In February, Twitter added its data to the mix revealing the magnitude and velocity of tweets. As of today, more than 50 million tweets are published in the statusphere, not to mention the distribution and syndication of those tweets across multiple social networks. According to the Twitter team, that’s an average of 600 tweets per second. Folks were tweeting 5,000 times a day in 2007. By 2008, that number was 300,000, and by 2009 it had grown to 2.5 million per day. Tweets grew 1,400% last year to 35 million per day. Today, we are seeing 50 million tweets per day—that’s an average of 600 tweets per second. The state of the Twitterverse or the Twittersphere if you will, has less to do with what “is” and more to do with what’s possible. I’m focusing my time on the latter. However, it takes Twitter, as a technology and as a business, to realize that what it is and what it wants to be, is distanced only by the actions it takes today. Meaning, the user experience starts upon the initial visit to Twitter.com and it continues long after registration. There’s much to be done – especially as Twitter has yet to truly demonstrate its value as an independent network for the masses. I Tweet, therefore I am…part of a larger movement to expand awareness, literacy and connections that escalate causes and conversations that are greater than, but still complement, my purpose for engaging online. In an ideal world of transparency, there would be no unattributable briefings - and no 'off the record' comments. But we don't live in that perfect world. Briefings - often resulting in coy comments such as 'sources close to the Prime Minister confirmed' - are a form of institutionalised insider gossip that suits the media and PR people close to power. What principles can we apply to guide us through these murky waters? Remember that one guiding principle - to tell the truth - often conflicts with another principle - to respect client confidentiality. Getting hold of episodes of the For Immediate Release (FIR) podcasts to listen to on your mobile device whenever and wherever you want to is pretty easy. The two most most popular ways to do this are subscribing via iTunes – a prime choice especially if you have an iPhone, iPod or iPod Touch – or subscribing via one or more of the RSS feeds on the FIR website. In either case, you get the MP3 file on your computer which you then either synchronize to your mobile device with iTunes or other program that let’s you do that (Winamp is one), or manually copy the file to it. If you have an iPhone, an iPod Touch or a device running the Android OS, there’s now an even easier way to get your podcast episodes with the new FIR app, now available in the iTunes App Store and the Android Market. There’s currently no cost – the app is free to download and use. 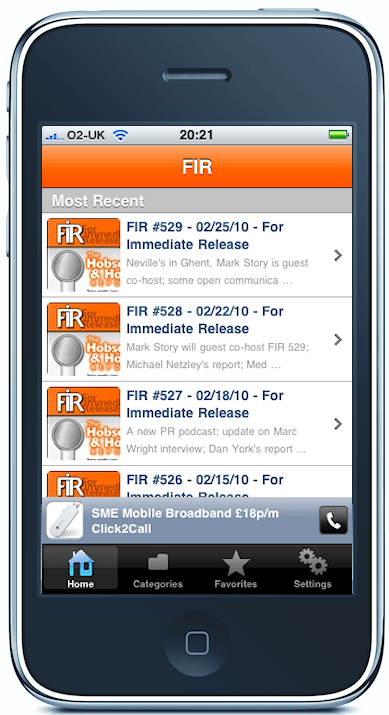 The FIR app presents the five distinct FIR podcasts – The Hobson & Holtz Report, FIR Cuts, FIR Interviews, FIR Book Reviews and FIR Speakers & Speeches – organized into categories that make it very easy to find just the content you want all in one place on your mobile device. The default category when you start is ‘Most Recent,’ a perfect way of auto-organizing content for most people. Categories bring some essential organization to your FIR collection on your mobile device, making it simple to select particular content you want. You might notice one podcast not included – FIR Live on BlogTalk Radio, the live show we do once a month or so. That’s because recordings of those live shows are included in the Hobson & Holtz Report category. 1. Load the App Store on your device. 3. The FIR app should be the first result you get – it was when I installed it yesterday – as the screenshot shows. There you have it – the FIR app installed on your device, ready to go! The FIR app for iPhone and Android was created with iSites.us, a new app creation service launched in January by California startup GenWi. Just $25 and we have an app. A brilliant service. Creating a mobile experience has never been easier nor cheaper. We’re thrilled with our first app creation and hope you find it useful and an enjoyable experience. Do let us know what you think. If you have any suggestions for improvement, we want to hear that, too. Anticipation (knowing what the organization needs to see and hear). Casper talked about what he did once he agreed to take the job. He was an “outsider” CEO so he was unknown to employees who were dealing with a change in ownership. He mentioned how the first person he asked to talk to was the head of corporate communications because that person would know best what he needed to know, how to resonate with employees and gain traction internally and externally. He was delighted when she showed up with a playbook in hand. Access (making sure that he demonstrated that he was available and accessible personally). To develop that bond with employees, Casper along with corporate communications set up regular lunches with high potentials, monthly town meetings, and an online ABCs (Ask Brad Casper) on the intranet. He also started Breakfast with Brad and had lunch with new employees. Being accessible was one way to create that bond that builds CEO reputation and drives productivity and inspiration. Awareness (to demonstrate that this was a new beginning since they had just been bought by consumer goods giant Henkel in Germany), the CEO and corporate communications decided to bring everyone together to participate on this journey. They rented out a nearby movie theatre within the first 100 days and had all employees attend to hear about the new strategy, hear about the future, create a vision, and help build a bridge between being what was once a U.S. company (Dial Corporation) and the multinational they were now. Alignment (aligning the strategy with the core values and history of Henkel). Casper talked about the resonance of being part of a family. Several generations of the Henkel family had created this Fortune 500 company and this emotional narrative had to be intertwined into the NA Henkel fabric. He used this expression at our conference that stuck in my mind—that they would build their brand not as a company “but as a house.” That has a nice ring to it. Affinity (creating a family atmosphere that is inclusive and engaged with the community). Working with corporate communications, the leadership team worked hard to celebrate innovation, community service and other ways of giving back. Accidentally as they moved headquarters to a beautiful new building, instead of giving everyone the day off on a Friday as the movers packed up, they decided to give back to the community by having everyone volunteer their time in the community. This turned out to be one very smart way to build that camaraderie that helps bind employees to companies and remove doubt that business is all about the bottom line. Accountability (the CEO is accountable as well as its employees for the company’s success). Reputation is often said to be greater than the sum of its parts. However, making sure that all the parts work together and are communicated internally and externally builds longer-lasting reputations. CEO communicators can help make reputations stickier and advance a common purpose. What do Efrem Luigi Epstein, Michael Zakkour and Sophie Hanson all have in common? They all worked at Peppercom. Having read that companies such as IBM and Microsoft have not only built robust alumni networks, but also written millions of dollars of incremental business from loyal, former employees, I thought it was high time Peppercom reached out to the hundreds of people who have passed through our hallways over our 15-year run. So, drum roll please, welcome to the Peppercom alumni network. Having re-connected on Facebook with long-forgotten people from St. Francis Grammar School, Ridgefield Park High School and Northeastern University, I now look forward to chatting up the likes of Roger Dowling, Petey Harris and Ketley DeJesus. We're hoping to host monthly chats on our LinkedIn page, discuss topics of interest and just reminisce about those lazy, crazy, hazy days of yesteryear (and those clients from hell, the not-so-secret office liaisons and a softball team that ended up with a losing record regardless of who managed or played. Stein: you still rank as the all-time worst manager, though). So, that's it. If you're out there and want to re-connect, please do. And, if you're one of those former clients from hell, we'd love to hear from you as well, if only to tell you how we REALLY felt about working with you. I can’t believe the day is finally here. In fact, it’s here earlier than planned. Social media has democratized influence, forever changing the way businesses communicate with customers and the way customers affect the decisions of their peers. With platforms like Twitter, YouTube, and Facebook, anyone can now find and connect with others who share similar interests, challenges, and beliefs—creating communities that shape and steer the perception of brands. Without engagement in these communities, we miss major opportunities to shape our stories. However, use of the tools does not guarantee that people will listen. Engagement is shaped by the interpretation of its intentions. In order for social media to mutually benefit you and your influencers and ultimately customers, you must engage them in meaningful and advantageous conversations, empowering them as true participants in your marketing, branding, and service efforts…this is true whether it’s B2B, B2C, government, non profit, education, etc. If it’s one thing that I ask, it’s that you please help me share this news with those around you. This book and all that’s in it, was written with passion and dedication over the last year to address the issues that have now become paramount to the success of social media within businesses and industries of all shapes and sizes. I wrote this book for you…and it would mean everything to me, if you could join me in leading a new, more meaningful era of socialized media and engagement. There’s no question that Corporate Social Responsibility (CSR) has hit the mainstream for companies of all sizes. The last five years have seen an explosion of interest in CSR (or Corporate Citizenship), driven by our changing society, pressure from employees, interest from customers and often a company’s own desire to have a positive impact. While CSR has become increasingly popular and arguably important from an image perspective, you don’t find a lot of content or discussion online about how companies should be thinking about how they communicate their commitment to CSR. Of course it goes without saying that we’re talking about appropriate communication here, but the reality is that many companies don’t share the great work they’re doing – and they should. Last week I had the good fortune of meeting with Kellie McElhaney, Corporate Responsibility Faculty Director at the Haas School of Business in UC Berkeley. She is a passionate advocate of CSR, but more importantly of CSR being aligned with a company’s core business strategy and of the need for companies to sensibly measure and promote the impact of their CSR efforts. I have just finished her book: Just Good Business and I would strongly recommend it. Kellie takes a real world, pragmatic view of CSR and how it can and should be connected and delivering value to your business – while also having a positive impact in society. The book doesn’t get lost in the theory but instead provides excellent real-world insights and examples of how companies are (and are not) effectively implementing CSR programs in their business. She also looks at the measurement and appropriate promotion of CSR efforts. As valuable as CSR is, it is not the panacea to all that ails companies – lousy products, overpriced services, poor branding, or inadequate customer segmentation – let alone all that ails the world. Similarly, I want to be clear that telling your story always holds an element of risk, although I would argue that the risk of telling your CSR story is likely significantly less than not telling your CSR story. If you’re working in PR and your employer or client is making an investment in CSR (and I’m imagining that if they aren’t they are in the minority) then do yourself a favor and buy the book. How we manage and communicate CSR is becoming more important and if you’re not already thinking about it, your probably should be – regardless of your industry or location. The “power” of the PR embargo..